Hemp seed oil has been known for centuries as an excellent source of vital polyunsaturated fatty acids. 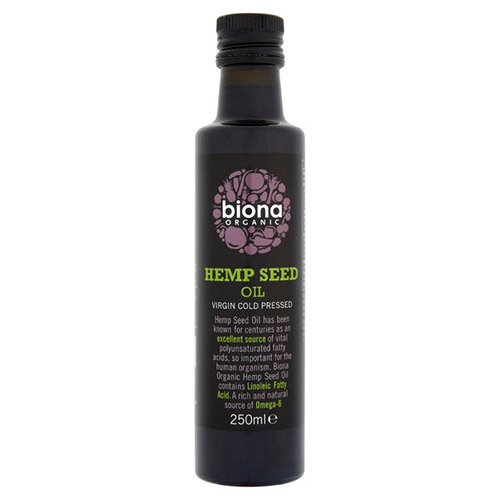 Biona Organic Hemp Seed Oil contains linoleic fatty acid. A rich and natural source of omega-6. Biona`s careful pressing and bottling method preserve the nutritional wealth, natural flavour and rich green colour as much as possible. Drizzle over your salad, savoury dish or simply enjoy on it`s own. 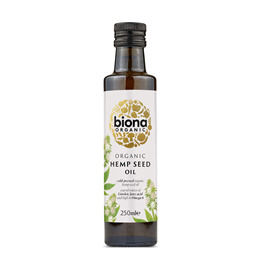 Below are reviews of Biona Organic Hemp Seed Oil - Cold Pressed - 250ml by bodykind customers. If you have tried this product we'd love to hear what you think so please leave a review. This is the second time I have been using Hemp oil, I really enjoy the taste and texture on my food, give it a try! I take a tablespoon of this everyday, as well as add to salads, etc... It's a good quality oil, with the typical hemp taste. It can also be used on the skin as it has a rating of 0 on the comedogenic scale.